circling in patterns, rhythms, in time, place, space. patterns a lifetime of harmonious living in society. This text/workbook draws on my experience as a dance specialist since 1965 in teaching basic academic concepts using a series of sequentially more complex rhythmic body movements combined and expanded into patterns. contain rhythmic elements or patterns. Patterns of rhythmic movement using opposition of arms and legs help develop right-left brain linkage. 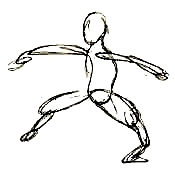 Example: walking steps with arms swinging at sides; as left foot steps forward, right arm swings forward. The nerve endings in sense organs feed the brain information for analysis and reflection through hearing; seeing; feeling in muscles, on skin and in motion; tasting; smelling. Allowing the student to learn with as many senses as possible helps instill new concepts, including basic academics. This theory of teaching, learning, using the bodily senses - body to mind, powered by spirited, enthusiastic energy - is a basis of somatic education and kinesthetic learning. Side view of correct posture. Balance centered just forward of shin bone at ankle. 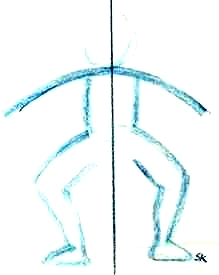 When standing on one leg the weight should be divided over the supporting foot, extending in a straight column upward. Center of leg upward through center of torso. If legs are apart weight is centered directly under center of torso. 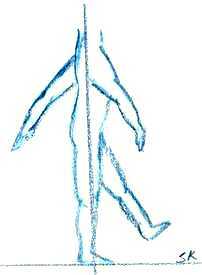 In normal walking type movements and knee bends the torso remains perpendicular to the floor. The tendency could be to let the weight lag behind. Drawing below is top view of foot flat on the floor. Pin-pointed are the three spots that receive equal pressure while bearing weight. The cross shows the balanced center of weight, just forward of juncture at top of foot and shin bone. As the foot rises from flat through various stages to highest level, toe joints and the ball of foot support weight. The center of gravity balances forward to form a flattened triangle of little toe joint, big toe joint, and center of ball of underside of foot. Students should be encouraged often to feel their own proper weight placement. With toes pointed forward heels touch or come together within the width of two of the students fingers. The insides of the knees touch, barring excess body fat. Characterized by the long bones of the thighs slanting inward from the hip joints. Ankles can not come together within two fingers widths of each other. The inner arches of the feet are likely to be weak, with weight centered under the big toe joints and insides of heels. As correct body alignment and weight placement is practiced, muscles strengthen and a more normal alignment becomes evident. Knock-kneed conditions can be somewhat corrected through practice of exercises which "turn-out" the legs. Sit on floor, legs touching, extended in front of body, knee caps facing ceiling. Point toes, tighten legs and rotate legs outward from each other while legs remain touching, causing backs of knees to face each other. The important point of the above exercises is that the whole leg rotate as one complete unit in the hip joint which is a ball and socket joint. 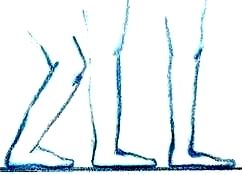 Characterized by space between knees when feet are parallel, heels touching. 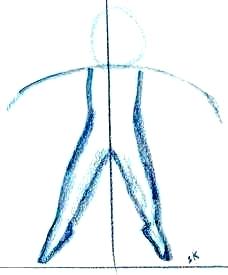 In a natural position as shown in drawing below, the body weight may be centered along the outside borders of the feet. As in the knock-knee problem careful practice with placement and weight distribution can effect a more normal alignment. The spinal column of vertebrae, cushioned by discs, are lined up in four natural curves. commonly called the tail bone. Could be a congenital deformity, muscular weakness, or the result of long-term nutritional deficiencies. Obvious deviations from normal should be diagnosed by a professional. Muscular weakness in the abdomen and lower back can cause the lumbar-sacral curve to be abnormally pronounced, a condition known as sway back. To prevent shock to the spine during the landing from jumps, the hip, knee, and ankle joints bend to receive the impact. Protect the feet and knees from harsh shock by gradually coming down through the underside of toes, ball of foot, and finally the heel. Stages of landing with foot and leg stretched in air. Pectorals, diaphragm, stomach, abdominals, lower back, middle back, upper back, and shoulder girdle. As the student becomes aware of and learns to control these muscle groups, they gain greater self-awareness in all daily living activities. blended into a continuous line of movement. 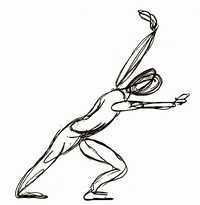 Rhythmic movement defines a stable repeating pattern, guiding the body by impulses; varying in dynamic quality and timing. Movements can work with the repeating pulse or in opposition, that is, between the beat. As the rhythm expands into its own pattern of phrasing, it leads the body onward through its sequence of movement. Steps flow together as a stream of water, without full stops. The body and music may pause but energy still flows, storing itself to gush out onward again. 1, 2, 3, 4, 5, 6, 7, 8 / etc. & 1 & 2 /& 1 & 2, / etc. 1, 2, 3, 4, / 1, 2, 3, 4, / etc. Step, step, step, step, / Step, step, step, step, / etc. 1, 2, 3, / 1, 2, 3, / etc. Just counts 1 and 4 are clapped. The push off in the gallop or skip is also counts 1 and 4. The class can practice clapping various rhythms while sitting in a circle on the floor facing in. Clap hands counts one, two. Clap floor counts three, four. Students pick up the pattern by watching their teacher feeling the rhythm within themselves. Exercises such as this with all the rhythms and the many possible combinations increase the power of concentration and acuity in hearing. Technique: While seated comfortably, teacher and student sing a song or nursery rhyme and clap every syllable of the words. Example: Each separated syllable in "Jingle Bells" is one clap. In a one horse o pen sleigh. The most accessible and basic of accompaniments. Feeling the beat within the body. Naturally expressing with the body. Each providing a different dynamic interpretation. Teacher and student can share, experience, and explore possibilities in "on the beat" and "counter-point" rhythms. A good accompanist is an asset. The musical interpretation can suit or create a mood. Time is freed from changing records or rewinding tape; perhaps losing the class's attention. Provide a background for the lesson. Variety can be provided if care is taken to search out appropriate music. The spontaneity lost without a piano can be made up for with greater use of rhythm instruments. Emotional intensity gentle to powerful. Muscular energy weak to strong. Transitions - gradual, sudden, or unexpected. While dancers move, the teacher sings or plays music or a rhythm instrument such as a tambourine or hand drum. Dancers with limited mobility can express with scaled down movements on the floor, bed, or in a wheelchair. Some ideas for moving expressively to music or rhythmic clapping are: feelings of joy; peace; happiness; sadness; birthday and holiday music; nursery rhymes and poems; folk dance music, classical music, etc. 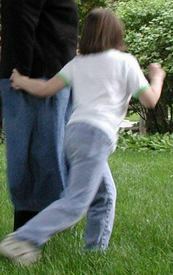 Dalcroze Eurhythmics is one way that explores the relationship of music and movement. 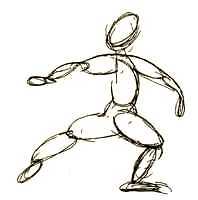 In the free-form of expressive movement, encourage dancers to explore moving in different directions such as forward, backward, sideways. Also, to crouch down low or move on tip-toe; to move dynamically or passively as the music or rhythmic accompaniment dictates; to move in circles around themselves in place or move in larger circles; to interact with others in the group perhaps making shapes together; to stretch out arms or pull arms in; lean head or turn head side to side; look up or look down, etc. Labanotation, as required for movement notation, analyzes the many possible ways to move dynamically in different directions and levels. Note: When the student is given a motion problem to solve, self-consciousness is overcome as the student becomes immersed in their creation. By the time the student has worked out how his body is going to move, self-confidence precludes self-consciousness. The resulting bounce against the force of gravity. Energy focused downward creates an equal reaction upward or sideward. The rebound changes in proportion to the energy expended in the initial movement. Hanging onto a breath. Sustained movement controlled by the length of a breath. Movement related to a constant beat rather than a breath. Overtones Sense of air still vibrating even though movement has ceased, giving the sense of moving in time. Expending Energy Sheer energy and intensity are different. Containment of energy creates intensity. Sharpness is achieved through the maximum use of energy in the attack of the movement. Motivation gives the movement more substance and quality. 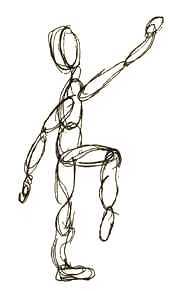 While the body is rooted in one spot, segments of the body move independently of each other, such as backward, forward, sideward, in spirals, swinging. 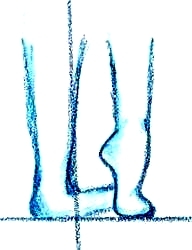 Low on the floor or close to it; middle as in normal walking level; high as on tip toe, jumping, arms extended upward. Around one's self, forward, backward, sideward, diagonally, in curves, circles, straight lines, geometric shapes. Motion with purpose, motivation, feeling, energy. requires personal exertion, energy and strength. In the traditional elementary school the exercises are for kindergarten through third grade. Students with less developed body-mind coordination at the beginning will need nurturing and individual assistance and patience from the teacher. Gentle prodding and encouragement aids the student's own initiative to progress through each new challenge. Benefits: As coordination in the rhythmic movements develop the body-mind connection, the students' ability to assimilate academic learning increases. Scientific research has shown that a student needs a certain level of synapse development between the right and left brain hemispheres before being able to be successful academically. By consciously and progressively taking students through the developmental stages in the following exercises, the right and left hemispheres are cooperating, because the left hemisphere controls movements on the right side of the body and right hemisphere controls movement on the left side of the body. Even quick steps varying in length and dynamic energy. Each foot pushes off to the other foot. Brisk even steps. Supporting leg remains straight. Many directions and patterns possible. Done in an even rhythm. Rhythmic loping movements, leading with the same foot forward throughout. Front foot steps forward and back foot pulls up to front foot with a shuffle. Arms on waist, outstretched, or in opposition. Many variations of basic step of keeping knees slightly bent while bottom of feet remain in contact with floor. Feet together then pushing apart and repeating sequence. Arm position varies: Hands on waist. Arms outstretch to sides. Arms in opposition for big slides. Hops are usually in a series. Done with both feet leaving floor and landing in unison. In take-off, knees bend first. Feet press into floor. Balls of feet push off floor. In landing, feet come down to floor in gradual succession. First balls of feet, then heels, then knees bend to absorb the shock of landing. Large springs from one foot to the next, to the next, and on and on. Each leap is in succession from push off of the foot that just landed. As foot lands, that knee bends to provide power for foot pushing off. Legs and feet are stretched while in mid-leap. Arms swing up to shoulder height in opposition for balance. Standing with feet parallel, one foot pushes forward onto ball of foot, stretching instep, then lowers while other foot simultaneously pushes up to ball of foot. Feet remain touching along inside edges. Hands on waist or outstretched to sides for balance. As in Pedaling, but foot that pushes forward passes through ball of foot to stretched foot, pointing toe and leaving floor slightly. Once step sequence is mastered a bounce is added by bending knee of leg that assumes weight, pushing off from bent leg for next prance. Practiced in place or moving forward or back. 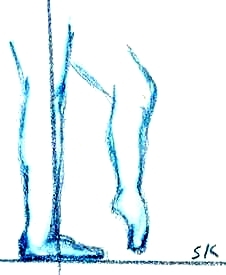 Supporting leg remains still while working foot points so that tip of toe lightly taps floor. One knee is raised, thigh parallel to floor. Arms swing from shoulders in opposition to knee that is raised in front. Walking steps in sets of three to count of three, one step per count. Count one is emphasized by flexing the knee that steps. Arms outstretched to side for beginners. Advanced arms: one in opposition, other to side. 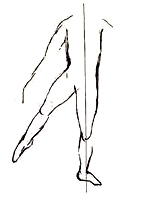 Pattern of 3 steps and a pause to point next toe forward, begin next sequence by stepping with toe that just pointed. Series of 3 walking steps with the 4th count being a hop on the same foot that took step number three. Two gallops in sequence with the lead foot being changed at the beginning of the following set of two gallops. Strong and sound they do their best work. 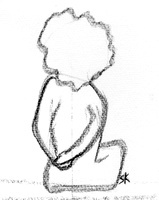 Sitting on floor, back straight, knees bent, bottom of feet together close to body, holding ankles with hands, gently round back and let head fall towards lap, letting the natural weight of body and gravity stretch the spine. Gently return to upright position; back stretched up straight like pulling up a 'zipper'. Sitting as in The Leaf, still holding ankles with bottom of feet together, straighten vertebrae one at a time beginning at lower end of spine. While holding the 'zip' allow knees to fall towards floor. 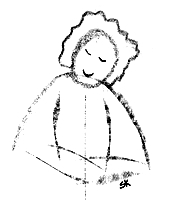 Holding body position as in The Flower, allow chin to rest forward to chest; then gently lift head till once again in the neutral position of looking straight forward. Slowly look upward and again return head to neutral. Now, allow one ear to lean towards its shoulder returning to neutral; and repeat with the opposite ear, returning to the neutral looking forward position. Now, chin to chest. Curl spine, one vertebra at a time from top of head down to base of spine, moving slowly. To unfold, reverse the process beginning with the base of spine straightening upward. Body position as in The Flower. 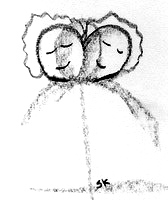 Clasp hands behind lower back and pull shoulder blades together slowly; hold momentarily and release. 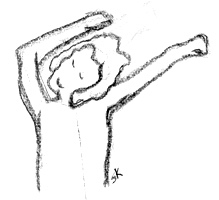 Raise both arms overhead and stretch one at a time slowly towards the ceiling. With back still zipped, stretch arms to side, making forward and backward arm circles, large and small. Gently twist upper torso above waist from side to side. Arms are extended to sides, head following direction of the back arm, then repeat with arms extended overhead. Keeping movement above waist, bend body sideways one way, then the other. Front of body remains looking forward. Rotate body to face one leg, reach down to hold onto leg with both hands and gently lean toward the leg, letting the weight of gravity help with the stretch. Repeat toward the other leg. Hold onto both legs, round back and gently lean forward looking toward the floor. Point and flex feet and ankles in unison, then try to point one foot while flexing the other foot. Press palms of hands together prayer fashion, applying medium tension. Lower arms should be parallel with the floor. Release tension, press again, release tension and extend hands and arms upward and outward in large circles, tips of fingers leading. Lie on back, legs touching, knees flexed, bottom of feet on floor, arms along side of body on floor. Lower spine below waist presses to floor, upper back is relaxed. Breathe evenly in and out in lung area. Contract abdominal muscles, hold 10 seconds, relax and repeat. 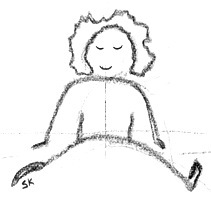 Lie on back, legs touching, knees flexed up towards the chest, arms resting on floor above head. Keeping lower back pressed to floor throughout extend legs towards sky while pointing toes, knees stretched. Lower legs as far as possible without releasing back from floor. Raise legs, flex in and repeat. Allow back to slope towards floor. 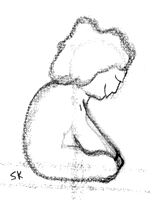 Then arch back, allowing stomach and abdomen to sag; looking forward and slightly up. Change position by rounding spine, contracting abdominal and stomach muscles and looking down to front of thighs. 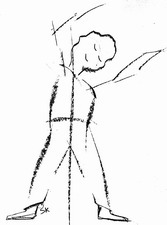 Keeping arms and legs stretched; one arm at a time is lifted towards ceiling and then lowered; later opposite arm and leg are raised at the same time. Develops capacity to isolate movement and exercises shoulder and hip joints. Turn head to look to one side over shoulder, then look over the other shoulder. Now focus forward and spin body around once in a complete movement, using hands to push off, coming back to the original position. 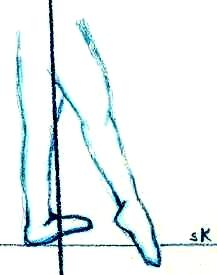 This exercise prepares for single turns while standing. Also, 'head turning' position is established as opposed to head leaning. An axial movement for energizing and for the transition from sitting to standing. Hold arms stretched upward, taut, and still for 3 seconds, and then stretch arms out to the side, held taut for 3 seconds. The body feels more energized after this stretch. 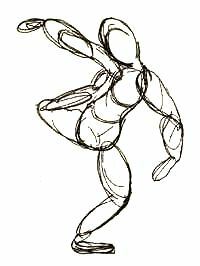 Then with a more relaxed body bend torso and knees and sway rhythmically in succession, with arms over head up and down, side to side. Leg swings, one leg at a time, also. General benefits include improved circulation, limbering large body muscles, increased flexibility of arm and hip joints. Stretch up straight with arms overhead to make body as a straight line. 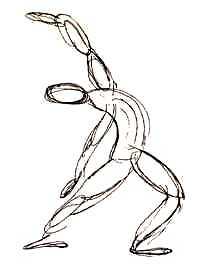 When stretched up straight bend body and arms to one side to form body into a curved shape. Hold arms overhead, hands touching for a circle shape. Students clasp hands together in front on themselves either while sitting or standing. Teacher sits or stands with her/his back facing students in front of them. Teacher clasps hands together and while keeping hands clasped traces an alphabet letter shape in the air in front of and just above head height so students can see the shape being made. Students join in copying teacher, keeping their hands clasped, while making the letter shape. Form the shape of a letter with the whole body; lying down or standing. To work out a word, have student first form shapes of all letters in the word, then plan the connecting movement as the most direct way to go from letter to letter. Form a capital letter beginning a word at a high level; remaining letters at middle or low level. Shape punctuation marks: period, commas, dashes, exclamation marks, question marks. Students move through their words in the sentence one at a time, ending with appropriate punctuation. A. Take walking steps to syllables; one step per syllable with a pause in walking at commas and end stops (periods, exclamation points and question marks). Also, try one clap per walking step. sings for his sup per. but bread and but ter? List vocabulary or spelling words; clap the accented syllable louder. Clap all syllables but clap the accented syllable louder. March 3 counts and pause in place for 1 count (comma pause), march 3 more times and stop for 2 counts (period stop or full stop). Turn in opposite direction at end of (period stop) and repeat sequence. March 6 counts and stop in place. At stop jump up and down once. March 6 counts swinging arms in opposition and stop in place. At stop begin with arms hung down in front of body, raise arms in front of body overhead hands touching and open arms out to sides in a half circle; right arm to right side, left arm to left side. gallop 8 counts moving forward and come to full stop for 2 counts. March 7 counts moving forward; turn around on 1 count in place, and gallop 7 counts back to beginning place. Turn to face beginning direction and repeat sequence. Practice in identifying the subject and predicate of a sentence. Subject: A noun or pronoun in first place in the sentence. Predicate: The state of being or action verb, and words related to the verb. Setting: Classroom where the student has space to move across the room to the door. "I walk to the door." On the subject word [I] the student stands still; on the predicate part of the sentence [walk to the door], which in this case has the action verb [walk], the student walks to the door and then stands still, signaling the completion of the sentence. Students create their own sentences with a subject and predicate; then come to the front of the room and act them out. Related benefits of being able to identify the parts of speech and diagram sentences come if a student studies a foreign language where the parts of speech are arranged in a different order than the student’s native language. An example of this is the difference between English and German, which are both Germanic languages. In German the verb is always in 2nd place in the sentence, and the indirect object precedes the direct object. English: "In the morning I walk to school with my sister." German: "In the morning, walk I with my sister to school." For communication with those who are hard of hearing, deaf, have a temporary speech impediment such as a stroke or tracheotomy, or one who can not speak but can sign. Fingerspelling needs only one hand, either right or left, to make the shapes. From my own experience summarized in the next paragraph it was easy to learn fingerspelling on my non-dominant after learning on my dominant hand; under one hour total for both hands. Provides a kinesthetic resource in learning to write the alphabet; each finger shape is completely different; none are possibly confusing opposites like 'b' and 'd' in the written alphabet. My experience: Using a picture of a hand shaping the letters I started making the shapes one letter at a time with my right hand, since I am right-handed, and added a letter on each go-around until I could do all the letters from memory several times. That took 20 minutes. Then I began making the letters a-z with my left hand. I found that learning the skill on my right hand jumped over to my left hand in half the time it took to first master on my dominant hand. Then I practiced words. Within 45 minutes I could use the letters in words at the rate of one per second, using either hand. Using the stronger hand, practice the alphabet letters till memorized. Then with both hands held in front, the weak hand resting on the lap, a tray, or table, if necessary, use the stronger hand to make the letter shape and at the same time try to form the letter with the weaker hand. If possible verbalize the alphabet letter while making the hand shape for further somatic practice. Making the letter shapes develops strength and coordination. Photos that follow are demonstrated with left hand but can be done with either hand; capital and lower case letters are not differentiated. Preparation: Each student needs 4 scrabble stands to place the block letters of the alphabet. Arrange the stands left to right in a horizontal line on the table in front of the student, and beyond the list of spelling words. Stand 1 place letters A-F. Stand 2 place letters G-L. Stand 3 place letters M-R. Stand 4 place letters S-Z. If more of one letter is needed extras can come from small piles in front of the appropriate letter on the stands. Procedure: Student places the list of spelling words on his left in front of him on the table, and then picks the correct letters from the line of scrabble letters to make the spelling words on the table to the right of the paper. Then the student puts the letters back into their correct place in ABC order on the scrabble stand. The student repeats this procedure with all the words in the list. Variation: Instead of using the 'scrabble' game pieces, alphabet blocks can be substituted by placing them in front of the student left to right in one or two rows of blocks (perhaps making the lines 2-high so more of the same letters are available), and laying the blocks beyond the page of spelling words. Benefits: Kinesthetic movement to choose and place the correct letters in a word. Eye-hand coordination development. Visual memory formed of the block letters in the word. By placing the letters back in correct ABC order, the alphabet is learned kinesthetically. While teacher has children standing up and facing him in a group, he signals the direction to move just by his arm and hand waving motions. All possible directions and high and low levels of moving can be explored such as close to the ground or on tip toe and even jumping. The game can use any movement the children have learned. The 'Which Way Game' strengthens and develops concentration, visual perception, non-verbal observation/communication skills. For younger students, teacher and student count to 8 as they do 8 gallops across the room; one count per gallop. For more advanced students count a higher number with marching, skipping, slides. Galloping across the floor individually as a set of 1. The example that follows is for 2 sets of 3 to equal six (3)+(3)=6 but any combination can be used. Preparation: Enough floor space for students to move freely across room. Students stand facing front of room on the side closest to their left shoulder, hands on waist. Teacher stands in front, also facing forward, hands on waist, and demonstrates sequence without speaking the first few times and then speaking the sequence later. Part I. Beginning at left side teacher does 3 slides toward right side of room, right shoulder leading, then pauses and repeats the 3 slides. Part II. The whole movement is repeated but this time the teacher says out loud one, two, three, (non-spoken pause) one, two, three. Students copy movement and speaking the 2 sets of one, two, three numbers out loud. Part III. Teacher repeats moving and speaking sequence but this time says one, two, three, (non-spoken pause) four, five, six. Students copy movement and speak sequence of counting to six. 1. Each number is a separate entity and when combined adds up to a greater number. 2. Sets contain elements that can be combined. 3. Moving left to right reinforces the direction of reading and writing on the page of paper. 4. Moving left to right teaches what the left and right sides of the body are and what moving to the right side means. A = 4 walks forward. B = 4 walks backward. Preparation: Students stand in a group in the center of room facing teacher at front of room; students remaining facing forward throughout. Teacher counts the numbers out loud and uses clapping or a rhythm instrument; one count per walking step. First students practice A and B separately; then the ABA sequence. For further practice, the teacher then calls out either A or B and the students do that walking pattern. Example: Even if the students have just heard A and walked forward 4 times, if the teacher calls out A a second time the students again take 4 steps forward. A = 4 walks forward; 4 walks backward. B = 4 skips forward facing forward; then turning to face the back of room and skipping 4 times toward the back of the room. Preparation: Students stand in a group in the center of room facing teacher at front of room. Teacher counts the numbers out loud and uses clapping or a rhythm instrument. One count per walk or skip. First students practice A and B separately. Next, teacher determines the order of the A and B sequences; students memorize the order from following the teacher's oral direction. Repeat a new sequence as often as necessary. Teacher counts the numbers out loud and uses clapping or a rhythm instrument. One count per walking step. Facing front walk forward 4 steps. Facing front walk backward 4 steps. Turn one complete turn in place, clockwise (toward the right side of body) around self with 4 steps. Turn one complete turn in place, counter-clockwise (toward the left side of body) around self with 4 steps. 3 students form a triangle. 4 students form a square. 5 students form a pentagon. 4 students arrange themselves into a parallelogram. 10 students could form an open-space 5-pointed star. Teacher clasps hands together and while keeping hands clasped traces a geometric shape in the air in front of and just above head height so students can see the shape being made. Students join in copying teacher, keeping their hands clasped, while making each shape. 12 students take hands in a circle, stretch out and drop hands. Teacher assigns each student a number beginning with the hour 1 and the student repeats his number as the teacher walks around the inside of the circle in a clockwise direction as the hands of a clock move. From this practice students also learn what clockwise direction means. Have students practice saying their number in order, 1-12, one by one. Another practice in this formation is for a 13th student to stand in the very center of the circle and point to a specific hour that the teacher calls out. Designate the front of the classroom as the top of a page of paper and the back of the room as the bottom of a page of paper, and the sides of the room as the sides of the page of paper. Students stand in a group on the left side of the room where the left-hand margin of the paper would be, facing the front of the room, (the top of the page), and then move toward the opposite side of the room with sideward slides remaining facing the front of the room all the time. Then students turn to face the side of room (side of page) they just came from and walk back across the room. Repeat as often as necessary to instill concept. A Basic 40 minute lesson plan follows, broken up into 8 five-minute segments. But any of the elements can be worked on one at a time, to make them a 'sponge' activity, absorbing a few minutes of extra class time productively. For the full 40 minute lesson there needs to be ample floor space to maneuver. Some choices if using the regular classroom are to move furniture to the outer perimeter of the room to free up the center portion, or to move furniture to the center of the room to work in a large outer circle. Shoes on or shoes off. 'Sponge' activities can mostly be done right alongside the furniture as it normally sits in the room. And the clapping and rhythm activities can be done right at the students work stations. Maintain eye to eye contact with the students. This develops their attention span. Work right along with them, encouraging cooperation between the generations. Wait for all students to give you their undivided attention before beginning; developing concentration. 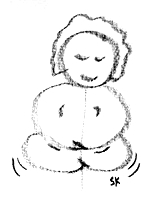 Wait for complete quiet before beginning; developing self-discipline. Keep a positive attitude with each student as they practice learning the sequentially more difficult body movements. Remind them that practice makes perfect. Success breeds self-esteem, especially in the child who has difficulty learning just by seeing, listening, and memorizing. Challenged students benefit through the coordination developed in mind-body movement. Encourage each student's individual progress. Success here encourages the child to try new things. Allow each student to 'star' in the lesson by individually moving in a rhythm by themselves going across the room or around the perimeter of students who are in a circle. Again, this feeds the student's self-esteem. Go on to the next segment of the lesson if children lose interest, and likewise stay longer with a segment that is spontaneously developing beautifully. This shows the child that it is okay to be flexible in changing circumstances. End a full-length lesson on an upbeat note by having the children gallop or skip out of the room or back to their work-stations. The exuberance generated by upbeat physical activity promotes, stimulates and invigorates. Large leg muscles - stretches for ankles, calves, feet, hamstrings. Torso, shoulder girdle, upper back, arms, wrists, fingers. Neck and spine. Use floor exercises progressively to warm up the muscles without strain. This sequence can be presented at the beginning of every session and the students memorize it very quickly. It is a complex memorization but the children's bodies quickly remember what comes next, achieving a sense a satisfaction and stability to ground them for the rest of the class which will be varied every time. Sitting in a circle cross-legged, begin with a familiar basic pattern and work into the rhythm planned for the particular lesson. Choose from rhythmic movements (1) through (16) that are already mastered by students; developing into patterns with dynamic. 'Back Exercise' followed by deep relaxation. Learning a new or reviewing a rhythmic movements (1) through (16). Alternately, practice with an academic concept in math, language skills, telling time, etc. Experimenting with directions, levels, turns, combination of rhythms, mime, pantomime. Exploring qualities of movement by listening to the tempo and color of music. Sitting cross-legged, listen and differentiate between the melody and rhythmic pulse of a song with words. Practice following the melody and rhythmic pulse with clapping. To finish lesson try rhythmic movements (4) or (12). Students enjoy leaving on a note of exuberance, warmed up and 'free to fly'. Beginning movements for this level are rhythmic movements (1) through (7). Include pantomime and nursery rhymes, if appropriate, in the creative portion of the class. As the basic rhythms are mastered combine sets of contrasting rhythms and vary the tempos. Gradually include all 16 basic rhythmic movements. Leave nursery rhymes behind and use mime to explore more of the students feelings and emotions. Find subtler gradations of dynamics. Keep expanding and building upon experience from lesson to lesson. Allow children more freedom to use arms differently in relation to their steps. Introduce skipping and waltz steps in individual circles around themselves while moving on a straight path. as "Free to Move While Learning the 3Rs"
Susan Kramer is a graduate of the Peabody Institute Dance Department of Johns Hopkins University, and has been a dance specialist for more than 30 years. In 100 pages, how to teach toddlers, preschoolers rhythms, floor exercises, large motor skills, expressive dance, kinesthetic mini-lessons and full dances. Fully illustrated. Basic lesson plan included. Perfect for homeschoolers, dance instructors and early childhood education teachers. Can be adapted for special needs children. for learning kinesthetically about math sets, sequencing, and language phrasing and rhythms. Can be adapted for special needs children. Rhythmic Movement Dance Series is a member of the GEM Consortium of the United States Department of Education. In loving memory of Helen Jimenez. to the children of Franklin School, Santa Barbara, California. grow, learn, and prosper best, when caring attitudes are put into action.